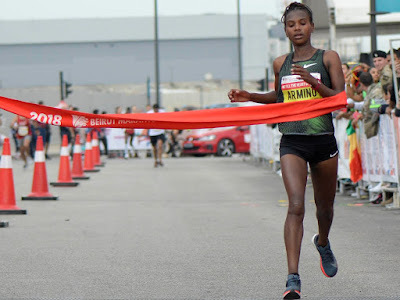 On what proved a magical day in the Lebanese capital, the women’s race also saw some swift performances, with Ethiopia’s Medina Deme Armino taking victory in 2:29:31 ahead of Nazret Weldu Gebrehiwet, who clocked an Eritrean record of 2:29:48 – the third and fourth fastest times in the race’s history. But it was El Aaraby who stole the show, the 28-year-old surprising the East African contingent with his surge early in the men’s race, taking full advantage of the hesitancy among his rivals as several leading contenders kept their eyes trained on Wesley Korir, the 2012 Boston Marathon champion who was running his first marathon since April 2017. After struggling with injuries on the build-up, Korir was far from his best, the Kenyan coming home seventh in 2:14:18, but given his shortened preparation the 35-year-old was upbeat about performance. 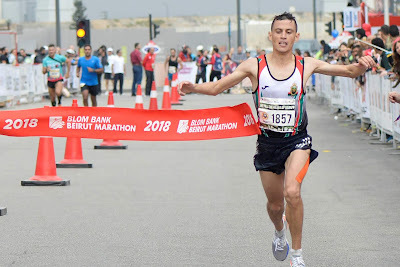 El Aaraby had come to Beirut primarily for the World Military Marathon Championship, run in conjunction with this year’s race, and as such he was not on the radar of many elite runners. As a result, when he pushed the pace along shortly after 10 kilometres, they let him go. El Aaraby ran behind one of the pacemakers until halfway, which he reached in 1:05:07, then ran most of the second half alone. Back in the pack, Korir’s rivals were still watching his every move, paying him more respect than he wanted as the Moroccan out front built an 88-second lead at halfway. 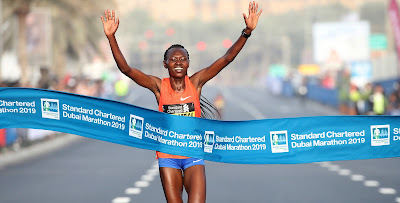 Up front, El Aaraby was churning out a relentless pace, reaching 30 kilometres in 1:32:33, at which point he had a lead of 1:36 on pursuers Felix Chemonges of Uganda and Deresa Geleta of Ethiopia. Hussein Awada was the first Lebanese male across the line, clocking 2:31:42. Poland’s Olga Kalendarova claimed the gold medal in the women’s World Military Marathon Championship, her 2:38:17 bringing her home ahead of countrywoman Aleksandra Lisowska (2:38:57). On a day when 48,000 runners took to the streets across the various races, Iran’s Mohammad Jafar Muradi claimed the men’s half marathon title in 1:07:00, with the women’s crown staying in Lebanon through hometown hero Chirine Njeim, who won in 1:20:09. The men’s race was won in a nail-biting finish by Ahmad Al Ghoul, who came from behind in the final metres to pass Lebanese compatriot Edward Maalouf, both athletes clocked at 1:25:45. Hassan Dia impressed with a third-place finish, clocking a personal best of 1:30:30. Kenyans will live to fight another day. Yes. They are coming for thes titles next year!